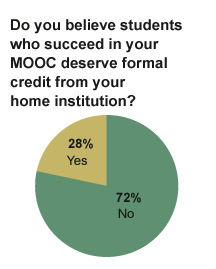 This is not a good sign for online education: 72 percent of professors who have taught Massive Open Online Courses (MOOCs) don’t believe that students should get official college credit, even if they did well in the class. More importantly, these are the professors who voluntarily took time to teach online courses, which means the actual number of professors who discount the quality of MOOCs is probably much (much) higher. The survey reveals the Grand Canyon-size gap between the higher-education establishment and the coalition of tech companies and lawmakers that are mandating college credit for online courses. Since the largest university system in the world, the California State University system, announced a pilot for low-cost online lower-division courses, schools from all over the country have raced to replace physical college instruction at a crazy fast pace. In only a month’s time, the University of Wisconsin started offering a fully legitimate college degree without any class time required and scores of schools announced that they will be emulating CSU lower-division pilots in the near future. This latest survey from The Chronicle Of Education reveals how little confidence professors have in their own courses. “The deck was somewhat stacked with true believers,” writes Steve Kolowich of The Chronicle about the survey, which polled the 184 known professors who have taught a MOOC. It’s early days for online education, and the old guard isn’t going down without a fight.